Resplendent in a sleek navy blue suit, his burnished dome gleaming in the light, Michael Jordan steps into the tunnel of Cleveland's Gund Arena, flashes a million-watt smile and gives LeBron James, the top high school player in the country, a warm, we're-old-pals handshake. "Where's Mama?" Jordan asks. "She's in New Orleans," LeBron says, grinning at the memory of how well his mother, Gloria, had gotten on with Jordan when they met in Chicago last summer. It's 10 p.m. on the last night of January, and the moment feels charged, even a little historic. Remember that photograph of a teenaged Bill Clinton meeting JFK? Same vibe. Here, together, are His Airness and King James, the 38-year-old master and the 17-year-old prodigy, the best of all time and the high school junior whom some people--from drooling NBA general managers to warring shoe company execs to awestruck fans--believe could be the Air Apparent. Powder Puff Highly popular in Finland, will the fledgling sport of Skimbatting take wing in the U.S.? Jordan has just hit another buzzer-beater to sink the Cavaliers, but another game is afoot. 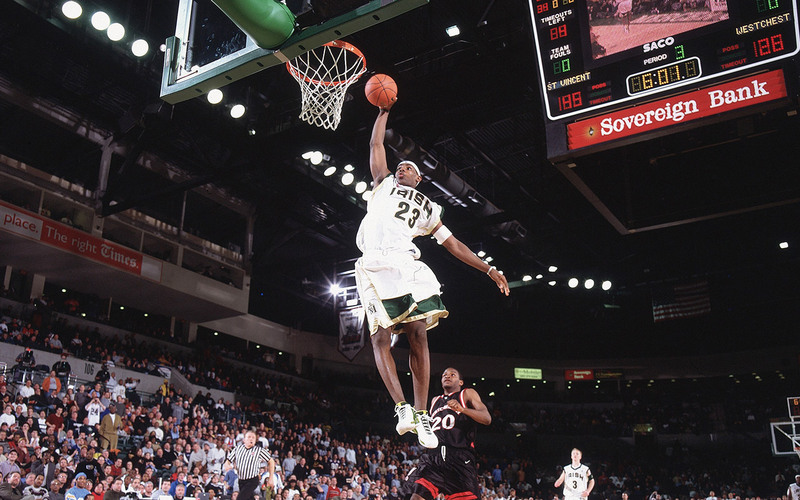 A spectacularly gifted 6'7", 225-pound guard who averages 29.6 points, 8.3 rebounds and 5.9 assists for St. Vincent-St. Mary High in Akron, LeBron is thought to possess all the elements necessary to do for some apparel company what Jordan did for Nike. Not only does he have the requisite high-flying game and an Iversonian street cred that Jordan himself lacked, but he can also turn on the charm when necessary. It's why LeBron is a year from signing what's expected to be the most lucrative shoe deal in history for an NBA rookie, estimated at $20 million over five years, and why Jordan, who represents his own division of Nike athletic wear, would want LeBron in the Swoosh family. Tonight, however, LeBron is wearing a black coat and stocking cap bearing the logo of Adidas, his high school team's sponsor, which Jordan can't help but notice yet chooses to ignore. They schmooze for a few minutes, bantering about LeBron's upcoming game, until Jordan leaves, offering this piece of advice: "One dribble, stop and pull up. That's what I want to see." LeBron nods and smiles. "That's my guy," he says. All things considered, it's hard to decide what's more impressive--that LeBron could be hailed as the best high school player even though he's only a junior, or that many NBA scouts believe he would be the first pick in this year's draft (if league rules didn't forbid his entering it), or that he can get an audience with Jordan as easily as a haircut appointment. 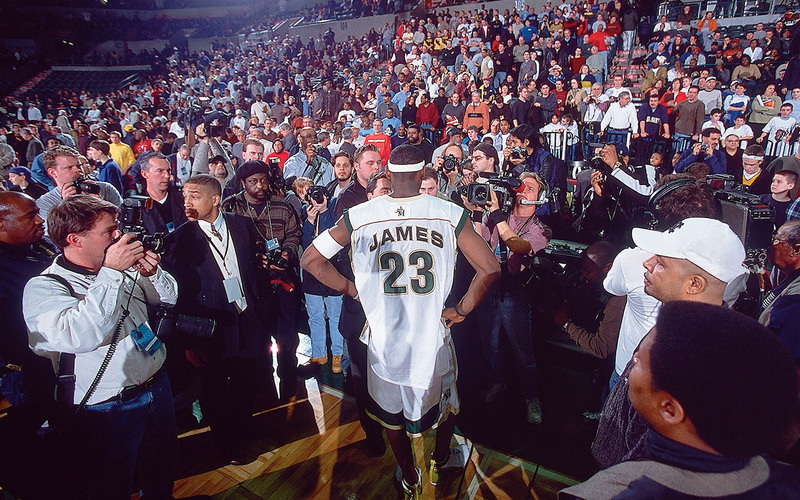 Then again, the world behind the velvet rope is nothing new to LeBron. Last summer he was the only schoolboy invited to play in Jordan's top-secret workouts in Chicago. LeBron speaks regularly with Boston Celtics star Antoine Walker, who is his best friend among NBA players. Those floor tickets to the Cavaliers game? LeBron's surrogate father, Eddie Jackson, simply made a call to Cleveland coach John Lucas. Already LeBron has hung out with Michael Finley, Tracy McGrady and Jerry Stackhouse, to say nothing of his favorite rapper, Jay-Z. "He's a cool guy too," LeBron says. "We went to his hotel first, and then I had backstage passes." Did we say LeBron just turned 17? "At this age LeBron is better than anybody I've seen in 37 years in this business, including Kevin [Garnett] and Kobe [Bryant] and Tracy," says Sonny Vaccaro, the Adidas rep who signed the first shoe deals with Jordan (for Nike), Bryant and McGrady. Says Germantown (Pa.) Academy coach Jim Fenerty, who watched LeBron pile up 38 points and 17 rebounds in a 70-64 defeat of his Patriots in December, "We played Kobe when Kobe was a senior, and LeBron is the best player we've ever played against. LeBron is physically stronger than Kobe was as a senior, and we've never had anybody shoot better against us." "There are only four or five players in the NBA that I wouldn't trade to get LeBron right now," says former Phoenix Suns coach Danny Ainge. If that sounds like enough hot air to pump up all the tires in Akron, check out LeBron's résumé. Last season, while leading St. Vincent-St. Mary to its second straight Division III state title, he became the first sophomore to win Ohio's Mr. Basketball award. His stock skyrocketed last July at the Adidas ABCD Camp, where he won MVP honors, and it threatened to soar off the charts after he totaled 36 points, nine rebounds and four assists to almost single-handedly keep the Irish close in a 72-66 loss to national powerhouse Oak Hill Academy in Trenton, N.J., on Sunday. Must have been the shoes: LeBron was wearing special American flag-themed Adidases given to him last Friday by Bryant, who was in nearby Philadelphia for the NBA All-Star Game. "A lot of players know how to play the game," LeBron says, "but they really don't know how to play the game, if you know what I mean. They can put the ball in the hoop, but I see things before they even happen. You know how a guy can make his team so much better? That's one thing I learned from watching Jordan." Indeed, while NBA scouts are universal in their praise of LeBron's all-around package--his shooting range, his fluid handle, his disarming explosiveness--their most common comparison is with another breathtaking passer, Magic Johnson. "The most surprising thing is that a guy who could dominate offensively is so unselfish," says one scout. "Most of these young guys don't know how to play, but he looks to make the pass first, and he's great at it." "If I were a general manager, there are only four or five NBA players that I wouldn't trade to get him right now," says former Phoenix Suns coach Danny Ainge, who was in Trenton to see LeBron play for the second time. "I love Jason Williams at Duke, and I've heard of the Chinese guy [7'6" Yao Ming], but if LeBron came out this year, I wouldn't even have to think about it. I'd take him No. 1." It's a moot point, though. After causing a stir last summer by saying that he might become the first high school junior to declare for the draft--and challenge the NBA rule which prevents players in this country from being selected until their high school class graduates--LeBron vows he'll stick around to get his diploma from St. Vincent-St. Mary in the spring of 2003. "The rule's not fair, but that's life," says LeBron, who has a 2.8 GPA. "I'll stay another year because my friends are here. The only thing I think is bad, they let that 17-year-old golfer [Ty Tryon] on the PGA Tour. You've got tennis players competing professionally when they're 14. Why not basketball players?" With LeBron staying at St. Vincent-St. Mary another year, the buzz around him should rise to an unprecedented level for a high school athlete. "This is like a mid-major college environment right now," says Frank Jessie, the school's athletic director. This year the Fighting Irish moved their home games to the University of Akron's 5,100-seat James A. Rhodes Arena. Some 1,750 season tickets were sold (at $100 to $120 a pop), and St. Vincent-St. Mary is drawing 4,075 fans, almost double the attendance of the university's men's team. 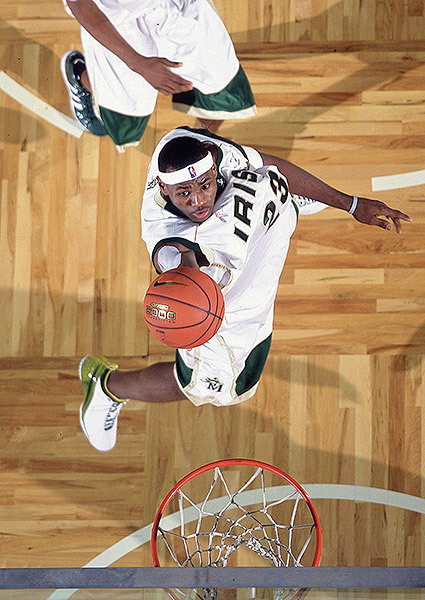 LeBron may be the reason for the hysteria, but he isn't your typical high school hoops phenom. For the last two years, in fact, he has risked career-threatening injury as an all-state wide receiver on the St. Vincent-St. Mary football team. At first Gloria refused to let LeBron play last fall, but after the 22-year-old singer Aaliyah died in a plane crash last August, he persuaded her to let him play. "You're not promised tomorrow," LeBron says. "I had to be out on the field with my team." Though LeBron did break the index finger of his left (nonshooting) hand, he helped lead the Irish to the state semifinals. "I saw drugs, guns, killings; it was crazy," LeBron says of his upbringing in Akron. "But my mom kept food in my mouth and clothes on my back." Gloria knows she can protect LeBron for just so long. She gave birth to him at 16, and after her mother died two years later, she and LeBron drifted from apartment to apartment around Akron. (On one occasion their building was condemned and bulldozed by the city.) "I saw drugs, guns, killings; it was crazy," LeBron says. "But my mom kept food in my mouth and clothes on my back." The Jameses' nomadic existence and unsettled home life took a toll, however. In the fourth grade, LeBron says, he missed more than 100 days of school. Nor did it help that Jackson, who has been in a relationship with Gloria since LeBron was two, spent three years in jail after pleading guilty to a 1991 charge of aggravated cocaine trafficking. Late in the fourth grade LeBron moved in with the family of Frankie Walker, his youth basketball coach. "It changed my life," LeBron says. "The next year I had perfect attendance and a B average." By the sixth grade LeBron was splitting time between the Walkers' home and Gloria's, and soon Jackson reentered the picture, providing financial support, Gloria says, from his work as a concert promoter and a full-time drug counselor at an Akron outreach program. LeBron, who has never met his biological father, refers to Jackson as Dad. 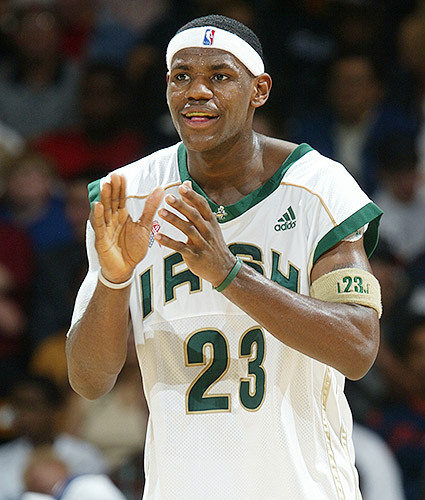 LeBron has been Akron's rising star ever since he led his eighth grade team to the finals of a national AAU tournament. Though he says he's considering Duke, North Carolina, Florida, Ohio State and Louisville, no one believes he'll go to college. Meanwhile Gloria, 34, and Eddie, 35, are busy crisscrossing the country, "listening to folks, letting them give their sales pitch, weighing the options," as Gloria puts it. They attended the Super Bowl in New Orleans after having met with "some representatives there in regards to some marketing" for LeBron, which is all Gloria will say. Adidas already has a relationship with LeBron through its sponsorship, now in its second year, of the St. Vincent-St. Mary team (LeBron even got to help design the Irish's uniforms) and of an Oakland AAU team that he has played on the last two years. Gloria and Eddie have visited the suburban Los Angeles home of Vaccaro, and LeBron has attended Vaccaro's ABCD Camp in Teaneck, N.J. Nike has gone to a full-court press as well, hosting Gloria and Eddie in Oregon for a meeting with company chairman Phil Knight. "Why go through the middleman when you can go straight to the top?" Gloria says. "Nike's very interested." Jordan could play a role too. "This is going to be like a Shakespearean drama," Vaccaro predicts. "Basically, only two people are involved: me or Michael? Adidas or Nike? Whoever it is, LeBron's going to translate far and wide. I believe that." "A lot of NBA players who wear Nike have never gotten to meet Phil Knight, but it's also an honor to meet the Adidas people like Sonny Vaccaro," Jackson says with perfect politesse. Either way, Jackson knows LeBron's in the driver's seat, yet he also knows firsthand that the distance from jail to the office of a multinational's chairman is shorter than you'd think. Not long before his meeting with Knight, Jackson pleaded no contest to a disorderly conduct charge and received a suspended 30-day sentence for his role in an altercation last July at an Akron bar. Cleveland Browns coach Butch Davis chatted up LeBron after the game. "Hey, LeBron! How you doing? Want to be a wide receiver for us? Just for the red zone, how about that?" For now LeBron exists in a weird netherworld between high school student and multimillionaire, between dependent child and made man. He's both, of course. At Gund Arena during the Cavaliers game, middle-aged fathers and mothers asked him to pose for pictures; LeBron dutifully complied. Later, an 11-year-old boy in a Jordan jersey collared him for an autograph, one of dozens he signed during the evening. Even Cleveland Browns coach Butch Davis chatted up LeBron after the game. "Hey, LeBron! How you doing?" Davis said, slapping him on the back. "Want to be a wide receiver for us? Just for the red zone, how about that?" It's heady stuff, but in so many other ways LeBron remains a kid. During a Cavaliers timeout, he frantically waved his arms as the rally crew shot plastic miniballs into the crowd. (He eventually snagged one, which he was still clutching when he met Jordan after the game.) On the ride back to Akron in a reporter's car, LeBron simultaneously blasted Jay-Z over the stereo, gabbed on his cell phone and checked his two-way pager for messages from pals like Sebastian Telfair, the Brooklyn whiz kid who's regarded as the nation's best sophomore. He's almost there, but not yet. Only one more year--with no injuries, no complications--and he'll make it. Then he can worry about the next step. Above the television in the Jameses' modest west Akron apartment, LeBron keeps an ersatz SI cover featuring his photograph and the cover line IS HE THE NEXT MICHAEL JORDAN? It's preposterously too early to answer, of course, yet judging from young LeBron's unprecedented rise, it's a question that is at least worth asking.